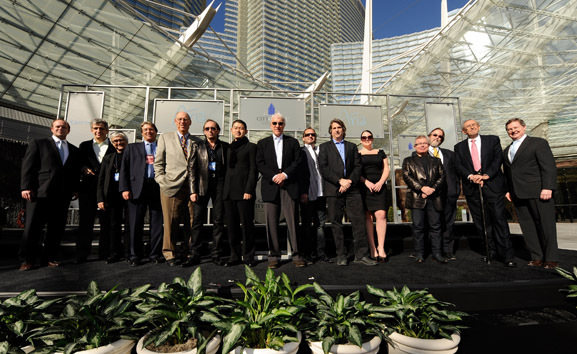 Crystals is “a 21st-century abstract park,” says architect David Rockwell. Is he for real? Crystals is a half million square feet of retail, entertainment and some impressive interior spaces. It’s not necessarily a place where ducks waddle around. The park analogy remains dubious, however, until Rockwell explains it. The most important parts of a park are open space, gatherings of people, and points of interest for people to gather around, he contends. Parks are also about freedom and flexibility: They have various trails to follow and offer different routes across the grounds. And, above all, parks are the result of design, Rockwell points out. “Central Park is a superbly choreographed path,” Rockwell says of New York’s most notable open space and citing it as an inspiration. Another inspiration is the entrance sequence of the Paris Opera House, in which the “path leading into the building, the lobby and around the stairs is also very beautifully choreographed,” he says. David Rockwell. Photo by Todd Plitt. To achieve a park-like effect at Crystals, Rockwell bent and twisted the traditional floor plan of shopping centers into a set of surprising, irregular interior spaces. Some walkways curve like never-ending streets, while others expand into long plazas. Several prominent objects—including Mastro’s, an extraordinary “tree house” restaurant—are sculptural forms that are good to look at. The interior of the 70-foot “organically shaped” tree house serves as an “oculus from which you can look back at the rest of Crystals,” according to the architect. Nearby, the walkway pavement is replaced by a bed of flowers—an homage to another of Rockwell’s inspirations: the biennial begonia festival in Belgium. The transition from Crystals to the Aria casino is a grand staircase with modern details; Rockwell describes it as a “glowing, modernist Fred Astaire meets the Spanish Steps in Rome,” he says. “Rockwell’s ideal is one of theatrical tactility, of sense and perception,” says Sven Van Assche, vice president of architecture and product design for MGM Mirage, developer of Crystals, part of the Las Vegas City Center. Rockwell “doesn’t go in for any single effect. He tries to excite people’s senses on multiple levels.” On that score and many more, Crystals delivers.